Name Variation George N. Alderin was also known as George G.
George N. Alderin was born on 23 September 1888 at North Dakota. He married Edith Roberts on 24 December 1912 at Lane, Oregon. George N. Alderin died on 25 September 1959 at Salem, Marion, Oregon, at age 71. Married Name 24 December 1912 As of 24 December 1912,her married name was Alderin. Edith Roberts was born on 29 September 1891 at Iowa. She married George N. Alderin on 24 December 1912 at Lane, Oregon. Edith Roberts died on 18 September 1964 at Salem, Marion, Oregon, at age 72. Edith Roberts obtained US Social Security Card at Oregon; last residence listed as Oregon. Harold D. Alderin was born on 13 August 1916 at Lane, Oregon. He was the son of George N. Alderin and Edith Roberts. Harold D. Alderin died in July 1978 at age 61. Harold D. Alderin obtained US Social Security Card at Oregon; last residence Eugene, Lane, Oregon. Raymond N. Alderin was born on 3 November 1919 at Oregon. Raymond N. Alderin died on 16 February 1999 at Salem, Marion, Oregon, at age 79. Raymond N. Alderin obtained US Social Security Card at Oregon; last residence Salem, Marion, Oregon. Name Variation Hubert Greenheck was also known as Grunheck. Name Variation Hubert Greenheck was also known as Hubert Greenheck. Hubert Greenheck married Agnes Roschen. Hubert Greenheck was born on 2 November 1824 at Prussia. He was the son of (?) Greenheck. Hubert Greenheck died on 21 January 1906 at age 81. [S247] U.S. Federal Census 1870 U.S. Federal Census, by Ancestry.com, Page 23. Stamp 650. Dwelling 165. [S246] U.S. Federal Census 1880 U.S. Federal Census, by Ancestry.com, NA Film Number T9-1445 Sheet 106A. Married Name Her married name was Grunheck. Married Name Her married name was Greenheck. Agnes Roschen married Hubert Greenheck, son of (?) Greenheck. Agnes Roschen was born in 1825 at Prussia. She died on 21 August 1894. Martin Greenheck was born in March 1856 at Wisconsin. He was the son of Hubert Greenheck and Agnes Roschen. Martin Greenheck married Margaretha Schmitz, daughter of Mathias Joseph Schmitz and Christina Schmitt, on 21 February 1884. [S245] U.S. Federal Census 1900 U.S. Federal Census, by Ancestry.com, ED110. Dwelling 134. [S364] Wisconsin State Census Wisconsin State Censuses, 1895 and 1905, by Ancestry.com, Dwelling 213. [S244] U.S. Federal Census 1910 U.S. Federal Census, by Ancestry.com, ED89. Dwelling 209. [S243] U.S. Federal Census 1920 U.S. Federal Census, by Ancestry.com, ED195. Dwelling 57. [S250] U.S. Federal Census 1930 U.S. Federal Census, by Ancestry.com, ED52-10. Dwelling 39. Lucy Greenheck was born circa 1858 at Wisconsin. She was the daughter of Hubert Greenheck and Agnes Roschen. Katie Greenheck was born circa 1860 at Wisconsin. Anthony Greenheck was born circa 1865 at Wisconsin. Name Variation Ann Greenheck was also known as Annie. Ann Greenheck was born circa 1869 at Wisconsin. Name Variation John Eugene Greenheck was also known as Eugene. Name Variation John Eugene Greenheck was also known as Gene. John Eugene Greenheck was born on 8 October 1938. John Eugene Greenheck died on 19 October 1993 at age 55. Name Variation Margaretha Schmitz was also known as Schmit. Name Variation Margaretha Schmitz was also known as Margaret. Married Name 21 February 1884 As of 21 February 1884,her married name was Greenheck. Margaretha Schmitz was born in May 1858 at Wisconsin. Margaretha Schmitz married Martin Greenheck, son of Hubert Greenheck and Agnes Roschen, on 21 February 1884. Margaretha Schmitz died in 1944. Before 1895 Christina (Schmitt) Schmitz King with children. Margaretha Schmitz had 6 with 6 living in 1910 children. [S246] U.S. Federal Census 1880 U.S. Federal Census, by Ancestry.com, NA Film Number T9-1445 Sheet 103D. Name Variation Walter Hubert Greenheck Sr. was also known as Grunheck. Walter Hubert Greenheck Sr. was born on 24 January 1852 at Germany. Walter Hubert Greenheck Sr. married Helena Schmitz, daughter of Mathias Joseph Schmitz and Christina Schmitt, on 21 February 1882. Walter Hubert Greenheck Sr. died on 5 December 1938 at age 86. [S245] U.S. Federal Census 1900 U.S. Federal Census, by Ancestry.com, ED110. Dwelling 135. [S244] U.S. Federal Census 1910 U.S. Federal Census, by Ancestry.com, ED89. Dwelling 218. [S243] U.S. Federal Census 1920 U.S. Federal Census, by Ancestry.com, ED195. Dwelling 253. [S250] U.S. Federal Census 1930 U.S. Federal Census, by Ancestry.com, ED52-3. Dwelling 189. Name Variation Helena Schmitz was also known as Helen. Married Name 21 February 1882 As of 21 February 1882,her married name was Greenheck. Helena Schmitz was born on 25 June 1860 at Wisconsin. Helena Schmitz married Walter Hubert Greenheck Sr., son of Hubert Greenheck and Agnes Roschen, on 21 February 1882. Helena Schmitz died on 4 December 1954 at age 94. Before 1895 Christina (Schmitt) Schmitz King with children. Helena Schmitz had 7 with 7 living in 1910 children. Children of Helena Schmitz and Walter Hubert Greenheck Sr.
Name Variation Christina Susie Greenheck was also known as Susie. Name Variation Christina Susie Greenheck was also known as Christa. Christina Susie Greenheck married Michael Kaul. Christina Susie Greenheck was born on 30 March 1883 at Wisconsin. She was the daughter of Walter Hubert Greenheck Sr. and Helena Schmitz. Christina Susie Greenheck died on 1 January 1967 at age 83. He was born on 20 February 1885 at Wisconsin. He was the son of Walter Hubert Greenheck Sr. and Helena Schmitz. Arnold Greenheck married Rosina M. Hutter, daughter of Andrew H. Hutter and Margaret Eva Schwartz, on 19 November 1911. Arnold Greenheck died on 22 April 1980 at age 95 Arnold Greenheck obituary. 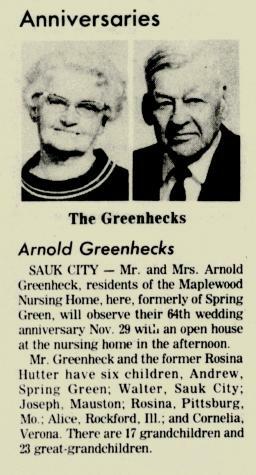 Arnold Greenheck obtained US Social Security Card at Wisconsin; last residence Spring Green, Sauk, Wisconsin. On 12 September 1918 at World War I Draft Registration, Jackson, Wisconsin. 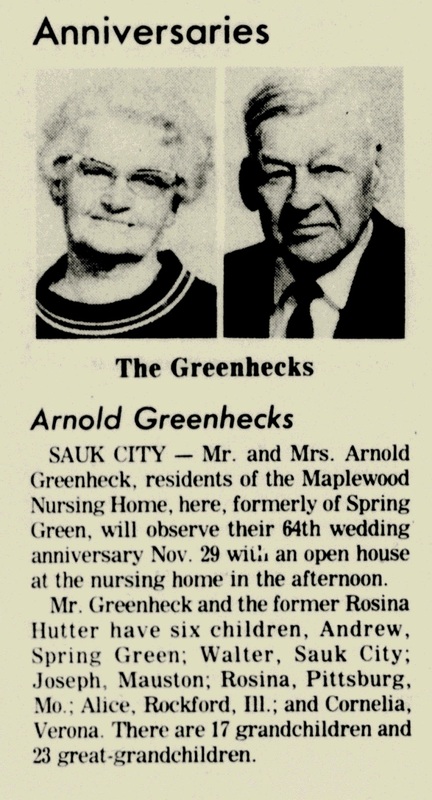 In November 1961 Arnold and Rosina Hutter Greenheck - Golden Anniversary. Name Variation Cornelius Leo Greenheck was also known as Cornealious. Cornelius Leo Greenheck was born on 14 March 1890 at Wisconsin. Cornelius Leo Greenheck married Rebecca Monica McCarville, daughter of Francis McCarville and Julia Farley, circa 1921. Cornelius Leo Greenheck died on 2 October 1940 at age 50. [S250] U.S. Federal Census 1930 U.S. Federal Census, by Ancestry.com, ED52-9. Dwelling 128. [S373] U.S. Federal Census 1940 U.S. Federal Census, by Ancestry.com, Year: 1940; Census Place: Ithaca, Richland, Wisconsin; Roll: T627_4518; Page: 2A; Enumeration District: 52-9. Eva C. Greenheck was born in April 1893 at Wisconsin. Eva C. Greenheck died on 21 April 1973 at Wisconsin. Walter Hubert Greenheck Jr. was born on 2 September 1897 at Wisconsin. Walter Hubert Greenheck Jr. married Susan R. Weitzel, daughter of Francis A. Weitzel and Margaret Anna Smith, on 2 October 1933. Walter Hubert Greenheck Jr. died on 29 October 1963 at Wisconsin at age 66. Name Variation Marie Helen Greenheck was also known as Mary Helen. Name Variation Marie Helen Greenheck was also known as Helen. Marie Helen Greenheck was born on 11 March 1899 at Wisconsin. As of 1940, Marie Helen Greenheck was never married. She died on 15 February 1968 at age 68. Marie Helen Greenheck obtained US Social Security Card at Wisconsin; last residence Lone Rock, Richland, Wisconsin. Hubert Greenheck was born on 8 December 1884 at Wisconsin. He was the son of Martin Greenheck and Margaretha Schmitz. Cornelius F. Greenheck was born on 5 February 1886 at Richland, Wisconsin, also reported as 05 Mar 1886. Cornelius F. Greenheck married Mary E. Thibault, daughter of Charles A. Thibault and Catherine E. Meyer, on 11 October 1921. Cornelius F. Greenheck died in March 1966 at age 80. Cornelius F. Greenheck obtained US Social Security Card at Wisconsin; last residence Lone Rock, Richland, Wisconsin. [S250] U.S. Federal Census 1930 U.S. Federal Census, by Ancestry.com, ED52-3. Dwelling 216. Name Variation Joseph John Greenheck was also known as J. J.
Joseph John Greenheck was born on 19 November 1887 at Lone Rock, Wisconsin, also reported as 19 Nov 1888. Joseph John Greenheck married Elsie Annette Pewe on 12 October 1926. Joseph John Greenheck died in June 1967 at age 79. Joseph John Greenheck obtained US Social Security Card at Minnesota; last residence Fargo, Cass, North Dakota. On 5 June 1917 at World War I Draft Registration, Kidder, North Dakota. Name Variation Henrietta Greenheck was also known as Etta. Married Name circa 1919 As of circa 1919,her married name was Christianson. Married Name circa 1919 As of circa 1919,her married name was Christiansen. Henrietta Greenheck married Claude L. Phillips at second marriage for her. Henrietta Greenheck was born on 15 July 1890 at Richland, Wisconsin. She was the daughter of Martin Greenheck and Margaretha Schmitz. Henrietta Greenheck married Charles Christianson circa 1919. Henrietta Greenheck died in 1980 at Freeport, Stephenson, Illinois. [S244] U.S. Federal Census 1910 U.S. Federal Census, by Ancestry.com, ED135. Name Variation Mary Antonia Greenheck was also known as Antonia. Married Name 15 November 1915 As of 15 November 1915,her married name was Adleman. Mary Antonia Greenheck was born on 18 November 1893 at Wisconsin. Mary Antonia Greenheck married Orville Maurice Adleman on 15 November 1915. Mary Antonia Greenheck died on 26 August 1986 at Freeport, Stephenson, Illinois, at age 92. Benjamin John Greenheck was born on 6 September 1897 at Wisconsin. Benjamin John Greenheck died in February 1982 at age 84. Benjamin John Greenheck obtained US Social Security Card at Illinois; last residence Freeport, Stephenson, Illinois. On 12 September 1918 at World War I Draft Registration, Richland, Wisconsin, listed as deaf mute. 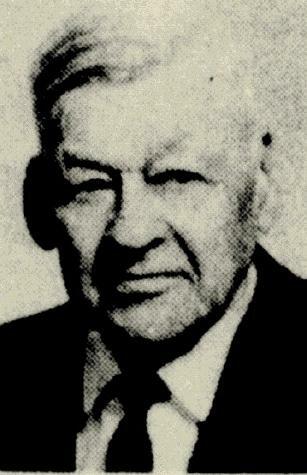 Joseph Mathias Greenheck was born on 14 March 1903 at Wisconsin. As of 1940, Joseph Mathias Greenheck was never married. He died on 8 March 1975 at age 71. Veteran - World War II - Pvt Army Air Forces. Joseph Mathias Greenheck obtained US Social Security Card at Wisconsin; last residence Lone Rock, Richland, Wisconsin. [S250] U.S. Federal Census 1930 U.S. Federal Census, by Ancestry.com, ED52-10. Dwelling 116. Name Variation Rebecca Monica McCarville was also known as Monica Rebecca. Married Name circa 1921 As of circa 1921,her married name was Greenheck. Rebecca Monica McCarville was born on 12 January 1893 at Wisconsin. She was the daughter of Francis McCarville and Julia Farley. Rebecca Monica McCarville married Cornelius Leo Greenheck, son of Walter Hubert Greenheck Sr. and Helena Schmitz, circa 1921. Rebecca Monica McCarville died in April 1978 at age 85. Rebecca Monica McCarville obtained US Social Security Card at Wisconsin; last residence Spring Green, Sauk, Wisconsin. [S245] U.S. Federal Census 1900 U.S. Federal Census, by Ancestry.com, ED129. Dwelling 80. [S243] U.S. Federal Census 1920 U.S. Federal Census, by Ancestry.com, ED160. Dwelling 27. Married Name 11 October 1921 As of 11 October 1921,her married name was Greenheck. Mary E. Thibault was born on 4 June 1902 at Wisconsin. She was the daughter of Charles A. Thibault and Catherine E. Meyer. Mary E. Thibault married Cornelius F. Greenheck, son of Martin Greenheck and Margaretha Schmitz, on 11 October 1921. Mary E. Thibault died on 11 September 1991 at age 89.